President-elect Barack Obama's run to the White House was something for the record books but even Mr. Obama would be impressed with the Bosco Ramos story. Ramos, a Black Labrador and Rottweiler mix, defeated two humans to win the election as mayor of Sunol way back in 1981. Ramos broke the species barrier 17 years before Obama broke the race barrier. Mayor Ramos served 13 years in office, until he died. He was interviewed on television, appeared on game shows and news reports that became controversial headlines in Communist China. Now the country's first non-human mayor will be immortalized in bronze. 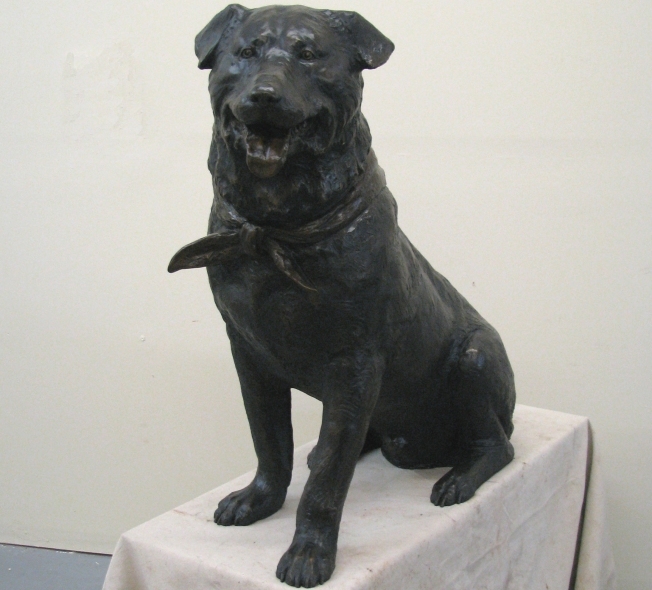 After a nationwide search, a group of Sunolians commissioned MFA Sculptor Lena Toritch to create a bronze portrait of Ramos that will commemorate the canine political symbol of democracy and humor. The statue dedication will be held in Sunol on Friday at 4:30 p.m. at the Sunol Post Office, 11925 Main Street. The idea of Ramos becoming mayor started as a joke amongst friends. His election quickly became world news in the early 1990’s. The Beijing newspaper, The People’s Daily, held up Mayor Ramos as an example of why free elections don't work. That prompted a story about Mayor Bosco on the NBC Nightly News with Tom Brokaw. Then in the wake of the historical Chinese protest in Tienanmen Square, Ramos joined Chinese students from Stanford University and UC Berkeley in protest in front of the Chinese Embassy in San Francisco. Reporters from around the world came to Sunol to meet Mayor Ramos. Japanese journalists interviewed the mayor and his staff and a Tibetan priest arrived at the Sunol Lounge, requesting to meet Bosco. News services in Germany and Holland carried the stories. When not representing the serious side of independence and creativity in democracy, Ramos was always a hit with Sunol residents when he led Halloween parades for Sunol Glen School, or wore his tuxedo vest to high social occasions. But mostly folks remember him wearing his everyday kerchief and that is how sculptor Lena Toritch has portrayed this likable canine. Toritch is a leading portrait sculptor who most recently created three heroic size statues for the Utah Law Enforcement Memorial at the Utah State Capital. Her current portrait work is a life-size bust of Obama. Toritch mastered anatomy, composition, and technique skills as a graduate student at the St. Petersburg Academy of Fine Arts in Russia. She left her hometown of St. Petersburg in 1995, seeking a place to express her creativity and develop her unique artistic style. She found that place in Salt Lake City at Young Fine Art Studio, which specializes in bronze monuments.